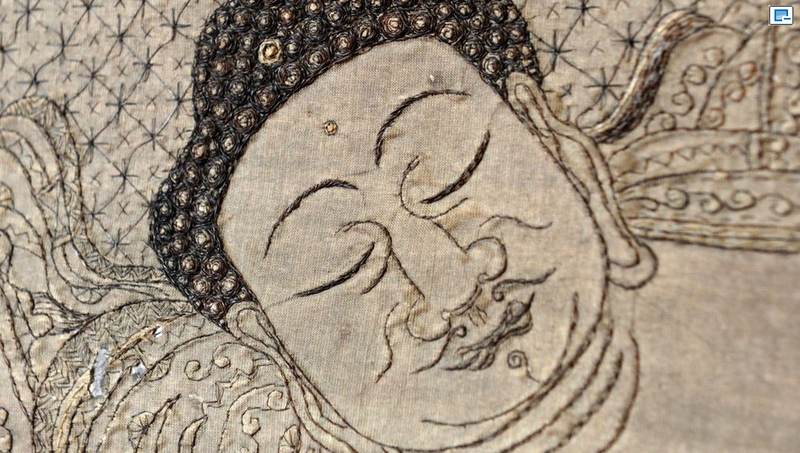 This 17th-century textile depicts Buddha in a state of nirvana. 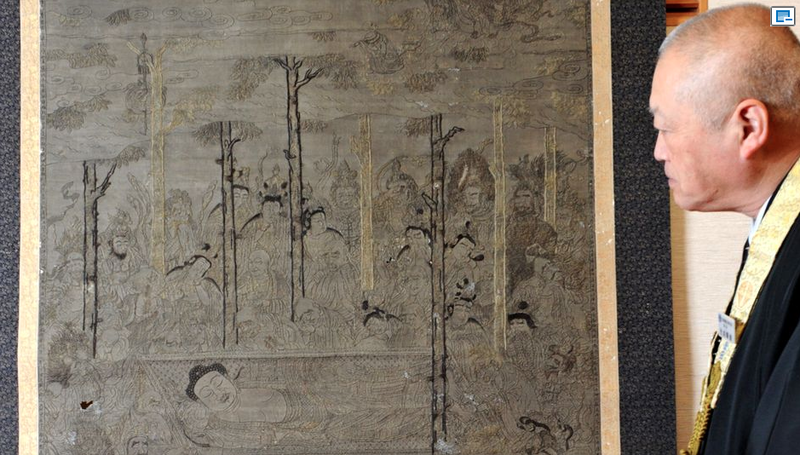 It incorporates embroidered human hair - black to represent the hair on Buddha laying on his side and gray to render the withered sal tree. The work measures 170.6 centimeters high and 84.2 centimeters wide. The textile panel was created in 1678 by a Buddhist priest and artist named Kunen, who collected hair from devotees who felt that their donation would help them in making merit and reaching paradise in death. "The phenomenon of embroidering devotional works using human hair seems to be a peculiarly Japanese response to image making, probably beginning in the thirteenth century and usually associated with the Pure Land tradition."1. I could not find any additional information about the artist Kunen, but the press release states that he created 72 textile works, some using the hair of at least 10,000 people! Only eight of his works survive. This piece was found in 2007 at the Joganji temple in Kyoto's Kamigyo Ward. It has been on view since February 8 in the Kyoto district office of the Jodoshu, or “Pure Land” sect, located in Higashiyama Ward. Admission is free. While not abundant, there certainly are many examples of Buddhist artwork which incorporate human hair. Most of these are in the Pure Land tradition. "Using the hair of devotees to represent sacred figures was a dramatic way to collapse the distinction between devotee and deity, to show the merging with the sacred for which devotees longed, in this life or after death."2. LEFT: Mandala of the Two Worlds. Kamakura period, ca. 1300; silk floss and human hair embroidery on silk; hanging scroll. Taisanji, Kobe. RIGHT: Raigo: Descent of the Amida Buddha. Muromachi period, 1400s; silk and human hair embroidery mounted as a hanging scroll. Cleveland Museum of Art. The use of human hair in these Japanese Pure Land embroideries likely began around the 13th century and then became more commonplace in the Muromachi period (1333-1573). They generally fall into two categories - those of predominantly figurative images and those that emphasize the written word.3. Above left is an embroidered shoji Mandala of the Two Worlds, a devotional textile in which human hair was worked into all the black sacred syllables that signify deities. Above right is a scroll representing the welcoming descent (raigo), the most ubiquitous of Japanese Pure Land images, here showing the Amida triad "offering the lotus throne on which the believer will be transported to salvation."4. "When devotees donated hair to be worked into these powerful images, another layer of meaning is added. Since hair often suggests wild, untamed, sexual energy, its use in embroideries can be seen as an attempt to control or transform that 'negative' power, to turn negative into positive, to make the imperfect into the perfect. Hair, signifying the human body, undergoes a purifying metamorphosis when used in these embroideries to depict the hair and garments, or the names, of sacred figures. The distinction between buddha and believer collapses and they become one."5. 1. Elizabeth Ten Grotenhuis, Japanese Mandalas: Representations of Sacred Geography, University of Hawaii Press, 1999, page 95. 2. Ibid.3. Elizabeth Ten Grotenhuis, Esoteric Buddhism and the Tantras in East Asia, in Handbook of Oriental Studies, BRILL, 2010, page 884. 4. Ibid, page 877.5. Ibid, page 891.